The Turkish government under Prime Minister Recep Tayyip Erdogan remains in its worst political crisis since coming to power in 2003. On April 3, access to Twitter in the country was restored after the Constitutional Court ruled that a ban imposed by Erdogan on March 21 was illegal. The prime minister had announced he would “wipe out Twitter” after reports of corruption in the government were widely spread on the network. YouTube was also blocked after a recording was posted purportedly of top government officials discussing military intervention in Syria. The bans follow a pattern of what critics consider increasing authoritarian tendencies displayed by Erdogan. In June 2013, police forcefully broke up protests in Istanbul after resistance to a park redevelopment escalated into a larger movement against Erdogan. Later in the year, the government removed police and prosecutors from their posts after more than 50 Erdogan allies were charged with corruption. Erdogan has portrayed the allegations as a conspiracy led by Islamic cleric Fethullah Gulen, a former supporter of the prime minister’s Justice and Development Party (“AK”). Gulen, who lives in the United States, leads the Hizmet movement, which fell out with the government after moves to shut down its network of private schools. Erdogan’s bombastic comments about foreign conspiracies are seen by critics as an indication that he will use further authoritarian tactics to suppress opposition. If the CHP were able to defeat the AK party in the next election, or Erdogan were forced out by his own party in favor of someone more inclined toward Gul’s view, it could have a decisive impact on the Syrian conflict, in favor of Assad. Ridding Turkey of a leader with an ego run amok might be positive, but would it be worth the cost of delivering victory to a regime involved in an internal conflict which has caused 150,000 deaths and refugees numbering in the millions? Scott Petiya is a 3LE law student at the University of Denver Sturm College of Law and a staff editor for the Denver Journal of International Law & Policy. On March 20, 2014, Turkey blocked its citizens from the social media website, Twitter. Turkish Prime Minister Recep Tayyip Erdoğan is the main culprit for this act. During a campaign rally, he stated “Now there is a court order. Twitter, mwitter, we will eradicate it all.” His purported reason behind the block: privacy concerns. Prime Minister Erdoğan claimed that the block was a response to Twitter’s refusal to implement several court orders. The court orders stipulated that the social media platform “remove some links” per alleged complaints filed by Turkish citizens. Despite this, many people around the world believe that the prime minister wanted to remove tweets that included hyperlinks to incriminating audio of the prime minister and other top officials engaged in corruption. 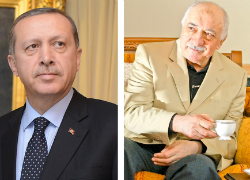 One such link contained audio of a male’s voice that closely resembled Prime Minister Erdoğan’s. The voice instructed another man to “dispose of large amounts of cash from a residence amid a police investigation.” Predictably, the prime minister denied any corruption. However, due to Turkey’s recent history of blocking social media websites, this looks more like an abuse of power to silence any opposition. Such drastic measures present two immediate concerns. A woman protests the Twitter ban by writing a physical tweet. Image Source: Adem Altan/AFP/Getty Images. First, blocking Twitter debilitates some Turkish citizens’ hopes of ascension into the European Union (“EU”). Stefan Fule, the EU’s commissioner for enlargement, recently stated that blocking Twitter “raises grave concerns and casts doubt on Turkey’s stated commitment to European values and standards.” This shows that Prime Minister Erdoğan only has his own political interests in mind, not the interests of Turkish citizens. Second, social media platforms like Twitter empower people because it gives them a way to speak out against an authoritarian regime. This is especially important given Prime Minister Erdoğan’s recent restrictions on the flow of information through traditional media, such as newspapers and television news. Sadly, Twitter is the only remaining avenue for the Turkish citizens. It is clear that the Internet has become the “last preserve of freedom of information in Turkey.” Thus, without Twitter, the prime minister hoped to silence the Turkish people. Objectively, Turkey’s block on Twitter was predictable. Many countries before Turkey have clung to such efforts in a last ditch effort to silence any opposition. However, the fact Turkish citizens have found ways around the restrictions showed that such oppressive measures are as draconian as the authoritarian regimes that instituted the blocks. As has been the case with other situations around the world, Turkey is the latest example of an undeniable truth: countries cannot block Twitter. Because of this, historically oppressive countries are losing their ability to deny a fundamental human right: the freedom of expression. Most conversations about Syria and Turkey currently revolve around the Syrian uprising, the regime’s repression of it, and a certain Turkish warplane shot down recently near the Syrian-Turkish border. However, a pre-existing, lower-level dispute between the two countries regarding the waters of the Euphrates river existed long before the uprising began, and will certainly continue afterwards, undoubtedly complicated by the events unfolding now. 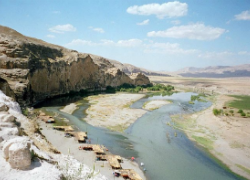 Where will the future of the Euphrates lead? In an age of increasing water scarcity, political and hydrological research in international river basins, along with the progressive development of international watercourse law, must be a priority for international organizations, academics, and policymakers. Otherwise, outcomes range from the occurrence of ‘water wars’ to continued disharmony and severe shortages for populations along the course of the dwindling rivers. Joely Denkinger is a recent graduate of the University of St. Andrews, Scotland. She graduated with an M.A. Joint Honours in Arabic and International Relations after spending one of her semesters at the University of Damascus, Syria, and writing a dissertation entitled, “Hydro-politics in the Euphrates River Basin: Perspective, International Law, and Negotiation Theory.” Her academic interests include Water Law, International Law, and Arabic language and culture. Following the warplane incident on June 22, when Syrian forces shot down a Turkish warplane, Turkish and Syrian relations have become further stressed by additional military response. Yesterday, Turkey responded by scrambling six fighter jets near the Syrian-Turkish border. Turkish officials claim this is a response, not only to the June 22 incident, but three additional incidents which occurred last Saturday, including Syria sending helicopters near the border. This is not the first action issued by Turkey in regards to this incident. On Friday, Turkey began deploying rocket launchers and anti-aircraft missiles along the border. According to the AP news agency, Syrian helicopters have flown within 6.5km (4 miles) of the Turkish border. Brad Bossenbroek is a rising third year law student at the University of Denver and a Publishing Editor for The View From Above. On June 22nd, Syrian armed forces shot down a Turkish F-4 Phantom Warplane, which burst into flames and crashed into Syrian territorial waters. Syrian authorities assert that the aircraft entered its airspace at low altitude and high speed, and that its defense forces acted legally in taking it down. “There was no hostile act against Turkey whatsoever. It was just an act of defense for our sovereignty,” said Syrian foreign ministry spokesman Jihad Makdissi. Others, however, are more skeptical of Turkey’s portrayal of the situation. 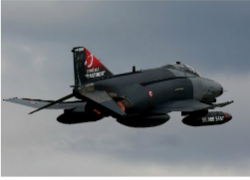 Some NATO members, including the United States, have privately expressed concerns that the Turkish jet was engaged in more than training exercises, as Turkey claims, and could possibly have been on a spy mission. 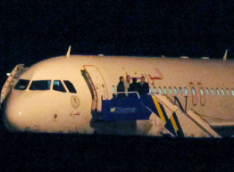 Turkey has admitted that the plane was equipped with surveillance equipment, but vehemently denies that it was spying. And even the doubters note that regardless of the nature of the Turkish mission, Syria’s response was not proper. 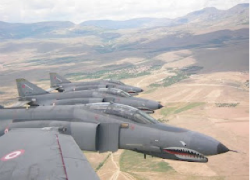 “When this happens between neighboring countries, you give a warning and then send up interceptors. You don’t just shoot down the plane,” said one source. The Syrian attack comes at a time of great general instability in Syria and dissatisfaction with Syrian leader Bashar al-Assad. Turkey in particular has been a harsh critic of Syria’s treatment of its own citizens, and Turkish Prime Minister Recep Tayyip Erdoğan’s personal relationship with Assad is reportedly very cold. With Turkey already an apparent safe haven for rebels intent on overthrowing Assad, the Syrian attack on the Turkish jet will only diminish an already contentious relationship.